Ukraine go into the game against England knowing a win will theoretically seal automatic qualification with just a home tie against Poland and a trip to San Marino remaining. A point for Roy Hodgson’s side will leave qualification in their own hands, with Montenegro and Poland still to visit Wembley. The sides have met five times previously, with England coming out on top on three occasions. Ukraine have been the victors once and one game has ended in a draw. England were fortunate to leave the Wembley pitch with a draw after Frank Lampard’s 97th minute penalty cancelled out Yevhen Konoplyanka’s stunning early strike a year ago. Ukraine will be still smarting from England’s European Championship win against the hosts in Donetsk’s Donbass arena where, after Wayne Rooney’s headed opener, Marco Devic had a perfectly good goal chalked off after John Terry cleared the ball from at least three feet over the goal line. Oleh Blokhin, who coached Ukraine in the reverse fixture stood down to take up the coaching reigns at his beloved Dynamo Kiev. Since then, Andriy Bal has been and gone after two inconspicuous performances. The Ukrainian Football Federation then briefly made flirtatious glances at both Sven Goran Eriksson and Harry Redknapp, before reverting back to type and hiring, the Lobanovskyi prodigy, Mykhaylo Fomenko. The basis of the new coach’s tactics remains the same, relying on a high-intensity pressing game. Compared to the authoritarian Blokhin though, Fomenko’s side has shown far more fluidity, with formation adapting throughout games from 4-3-3 to 4-2-3-1 to a loose 4-4-2. Despite the relative success of the 4-3-3 employed against Moldova, Hodgson’s characteristic conservatism will see James Milner’s shuttle-running prowess coming in to replace the suspended Danny Welbeck’s dynamic attacking zeal to produce a counter-attacking and cautious 4-5-1. The 23-year-old Dnipro Dnipropetrovsk winger has been in excellent form for his club in recent weeks and will look to cause the inexperienced Spurs full back problems. Despite this, if Walker can get on the front foot, his pace on the break could make a huge difference for England. At 34 and 131 caps, the Ukrainian captain is not getting any younger, but still remains an imperious presence in front of the back four. If England are to come away from Kiev with anything more than a draw, current creator-in-chief, Wilshere must find a way to throw off the Zenit midfielder’s shackles. It may only be his third game in an England shirt, but the Southampton forward has already begun to look a steady presence at this level. At 31, Lambert knows his own game inside-out, with movement as good as anyone around. If the England forward can produce the intelligent, space-finding manoeuvres he managed against Moldova, Khacheridi could have a long evening in store. 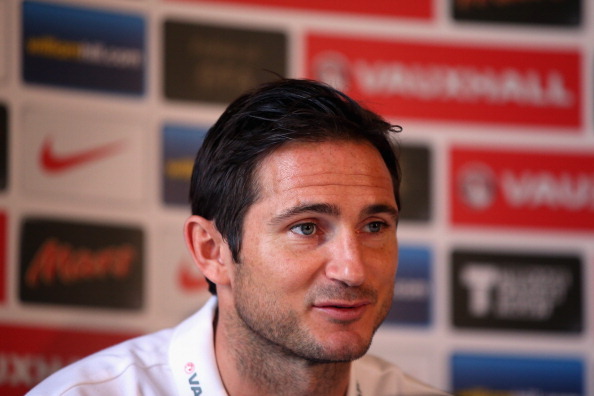 The end had appeared to be on the horizon for the Chelsea veteran at the start of qualifying last year, but as we look ahead to Brazil next summer, Lampard would appear as integral to England’s chances of performing well, should they qualify. The Gerrard-Lampard axis has evolved and, though it will face a tougher test than it did on Saturday against Moldova, the maturity and experience both men have shown when fielded together in recent times has been a refreshing final nail to the ‘can they really play together’ debate.